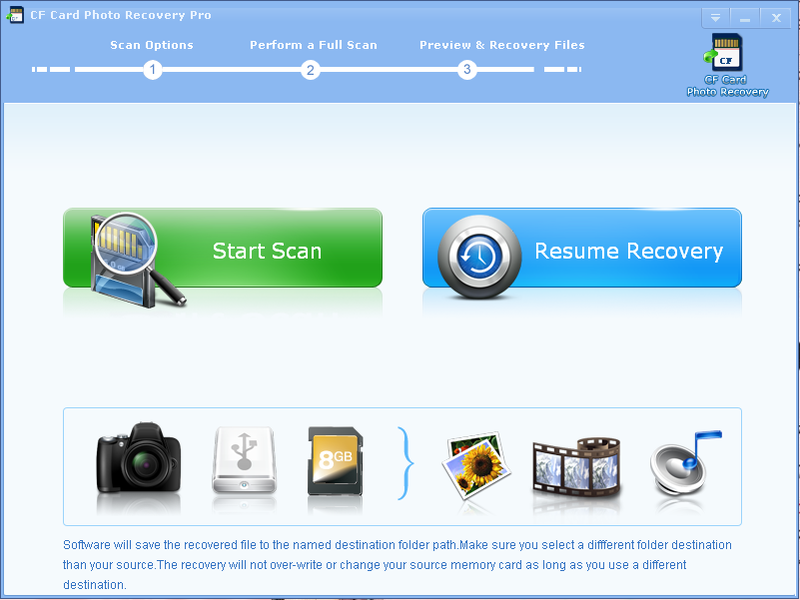 CF Card Photo Recovery Pro is excellent and renowned card recovery software which is ranked in the top in the industry. It recovers the photos, video, and multimedia files from SDHC card and saves them in just a few steps. CF Card Photo Recovery Pro is excellent CF card and photo recovery software. It concentrates in recovering many cards and removable storages such as SD Card (Secure Digital), Multi Media Card (MMC), Compact Flash (CF), XD Card, MicroSD card, , Memory Stick, Mobile phone memory card, Cellular phone, digital media, USB flash drive and as much as you can imagine. The great functions can support you to recover nearly all kinds of data or files. No matter what you lost, they will be retrieved. It will not only undelete your lost photos, if your removable device is formatted or deleted, no matter what you lost (data, files, images, photos, videos or audios), they will be back, as the CF Card Photo Recovery Pro owns powerful functions. It supports many situations that lead to the loss. These are: accidental deletion events, accidental formatting or reformat, improper operation, other recoverable scenario. For instance, virus infection, unexpected power off, lost photos during transferring photos from storage devices to PC/laptop, file system corruption (camera storage device, hard drive or USB flash drive), unexpected errors during low batteries and improper digital camera turn off, corrupted file format, populating an error message "File cannot be open", power failure of PC, causing logical File System corruption on storage device or any sort of errors and corruption causing the memory card unreadable. No matter which scenario you are facing, you are needless to worry about as CF Card Photo Recovery Pro will help you on this. Taken quite literally, it can be called your best friend and helper for so many people who are not very computer literate. CF Card Photo Recovery Pro can support all raw file formats. 2013-04-08 2.7.9 New feature preivew thumbnails of picture.